I don’t normally report on Facebook ads since most of you likely block them anyway and I could devote an entire book to how Chinese browser games engage in blatant fraud in Facebook ads either by outright lying about their games or going as far as using screenshots/video from other titles. And since League of Angels and GTArcade aren’t above stealing in order to peddle their self-playing browser “game,” it doesn’t surprise me at all that I would see the ad above on my Facebook feed. Yes, they actually bought the domain “amazingmmogame.com” for the purpose of this promotion. Notice that there isn’t actually any indication of what the game is. The 3d model in the image above is from a Deviant Art account and may or may not have been stolen, but since the ad edits out where the watermark is, I’m willing to guess probably not. But for now, let’s dive into this ad. Clicking the link brings you to amazingmmogame.com, and a series of questions to determine if you are right for the game. Finally a game that gates its community. Ask away. No. I won’t allow it. Your players probably “feel difficult to beat lvl 3” because technically the game plays itself. I’ve seen enough of these games to know that addicts are exactly the demographic that League of Angels targets, so yes. Yes, but I’m willing to bet that most of the other players are not 18. 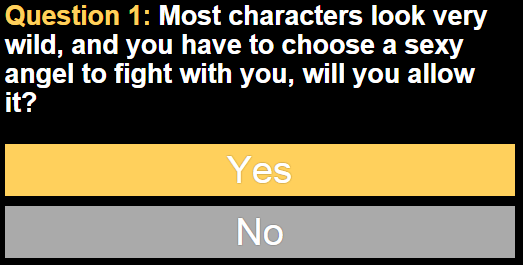 For what it’s worth, I answered no to all of these questions and the game let me in anyway. So much for League of Angels being a gated community.